This page is under construction. Please let us know what you think! 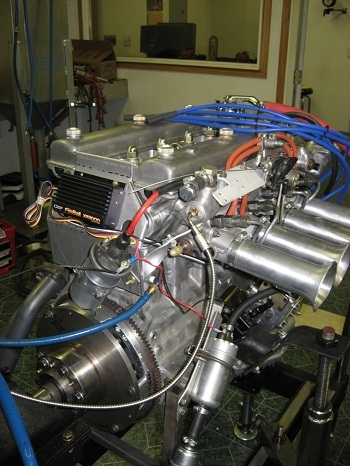 Check out our Dyno Tuning services! 45 mm TWM throttle bodies with velocity stacks. Lightweight 10.8/1 CP pistons and custom Carrillo rods. Darstan TS Headers. Electromotive Tec 3 distributor-less engine management system. 227 hp using 92 octane unleaded gasoline. Smooth idle and very streetable. Wide torque band through 8200 rpm. Breathtaking acceleration. We have been using these Guibo savers on all our performance and Race Alfas for over 15 years and have never had a failure. In 2012, we made several 1/4 mile acceleration runs at our 1/2 mile test track near our shop with Red Ryder. This was the first time I tested any 105 chassis and running gear for full hard/launch drag race results. On 6 different runs, we floored the throttle to 8000 rpm, dropped the clutch and with the Limited slip layed down about 20 feet of black rubber with the 9 in. wide Toyo's. I was prepared and expected that something would break, but there were no failures. To my surprise the car launched perfectly straight with just enough wheel spin to not bog the engine. 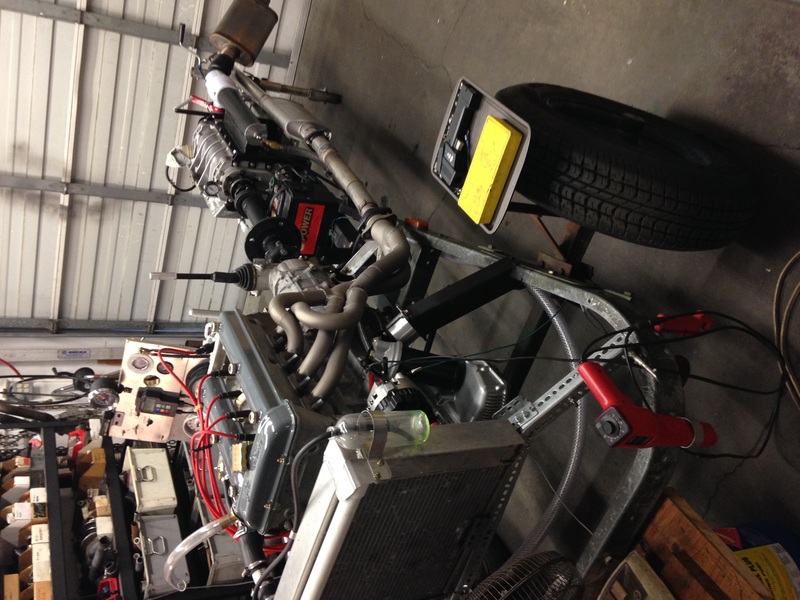 This was with our best 1750 engine to date that made 200.4 HP @ 7100 rpm and 162.1 ft lbs torque at 5300 rpm. Our 1/4 times were 12.85 seconds at 105 mph. 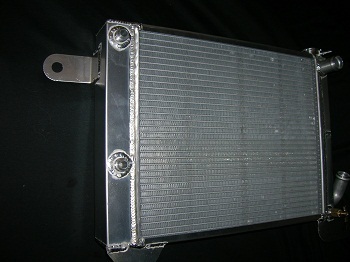 These aluminum radiators have greater capacity than the factory radiators and they weigh less. They cool so well that you can almost get by without a fan. These radiators have a double pass design with efficient horizontal tubes. The tanks are mounted on each side as compared to being mounted on the top and bottom as used on older factory radiators. 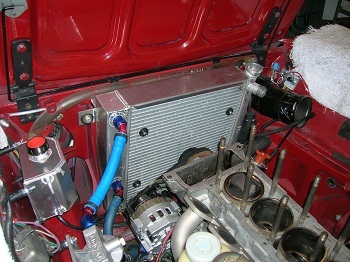 The built-in oil cooler/heat exchanger design does not impede air flow to the radiator. It allows for short oil hoses. Race cars do not need a separate oil temperature gauge since oil and coolant temperatures run about the same as operating temperatures. Use -10 female fittings for the oil cooler connections. These radiators generally bolt in to the original factory mounts. They were designed for track and race Alfas. Installation requires removing the factory fan. For street applications in hot weather a front mounted electric fan works well. We added the fan and temperature sensors due to requests from our customers for street use. In some cases, a particular installation may require modifications and we invite your suggestions. The stock bottom hose fits without modification. The top hose may require custom fitting using straight hose. We do not expect our radiators to fit all applications without some minor modifications. Specify 105, 115 or Twin Spark. Allow 45 days for delivery. Click here to see our pricing. We dyno tune all of our race engines before shipping. 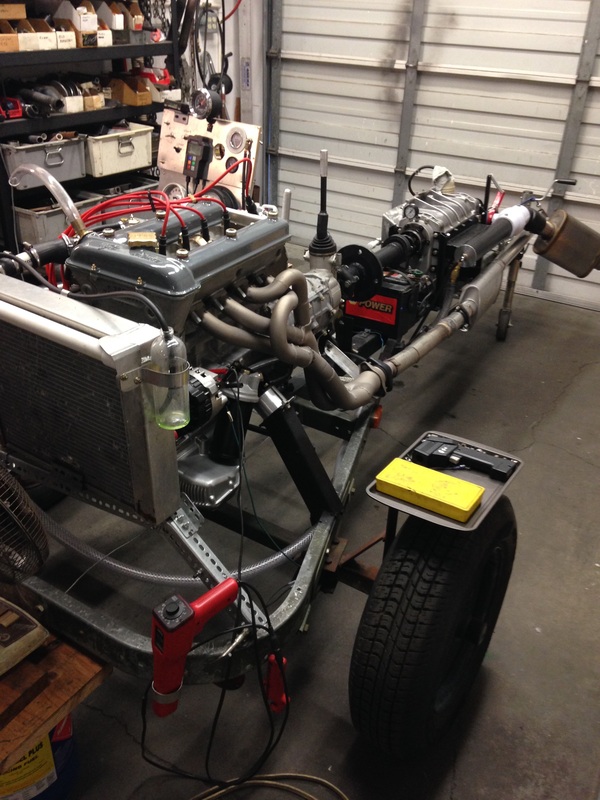 Like having an electrocardiogram, individual exhaust temperatures as well as O2 (oxygen) sensor readings are monitored. All the vital engine components are tested on the dyno: Ignition, fuel and intake system and exhaust headers for a complete Turn Key engine. 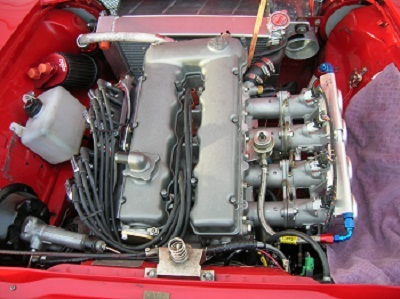 When sending your engine be sure to include all the vital components that you plan to run in your Alfa. Optional dyno tuning at Shark Racing in Sedro Woolley. 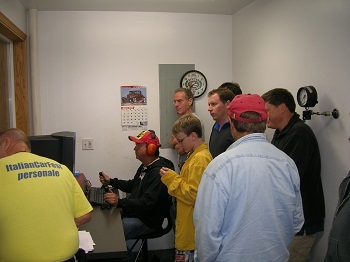 Ace Sprint car driver and engine builder Mark Huson running the Dyno controls. Notable Alfisti behind Mark: Ben Schotz and son, Austin TX; Max (hidden behind brother) and Andrew Banks, UK; John Trevy, Austin TX; Herb Sanborn, Burlington WA; Bob Fernald, Austin TX (looking through window). 6 inch Kinsler ram tubes attach directly to the Spica Throttle bodies. The velocity ram tubes increase power and torque over the hard to beat factory air box. Finding maximum ignition timing assures maximum power while protecting against detonnation. 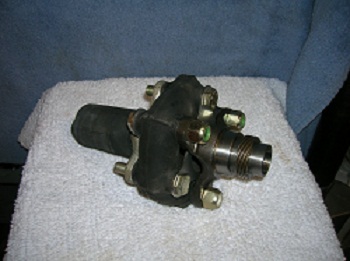 The distributor hold down clamp is then marked with a "set timing reference" on the engine. This should never be changed unless further engine modifications are made. Click here to see our pricing for this service. 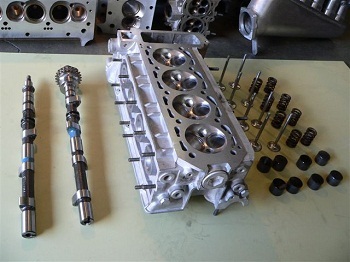 Our popular Spica Stage one cylinder head upgrade. 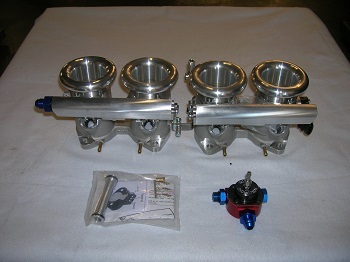 Std valves with 45 degree angles. Valves, guides and valve pockets re-shaped for Stg 1 improved flow. Ports cleaned but not oversized. Head re-surfaced. Our 10.2 mm cam: 10.2 lift x 240 degrees @ .050 lift. No loss of low speed torque, excellent idle quality. Completely assembled with valve lash set, ready to bolt on. 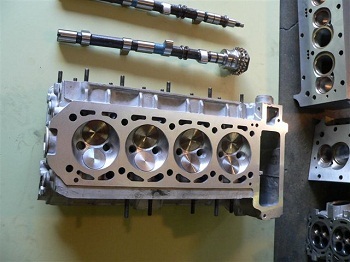 We prefer to service your cylinder head. Contact us regarding simple shipping details. Click here to view our pricing. 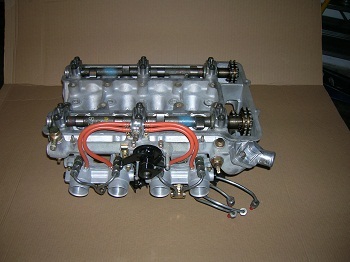 4C Twin Spark "75" head. Stage 3 preparation. 12 mm exhaust cam, 13 mm intake cam. 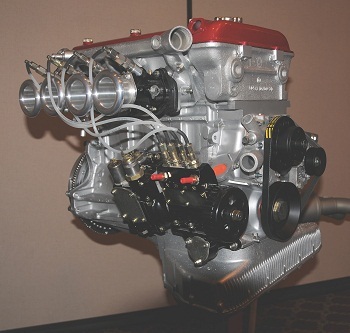 As compared to the earlier "Nord" engines, the TS has shallower combustion chambers due to the narrow valve angles. The piston is flat even with nearly 11: 1 compression. Much less ignition timing is needed due to a shorter flame travel. 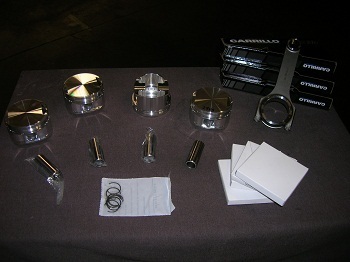 Twin Spark CP custom alloy 85 mm x 10.8:1 compression flat top pistons with Carrillo rods. For street, 91 octane unleaded fuel. Lightweight: 300 grams. Click here for pricing. 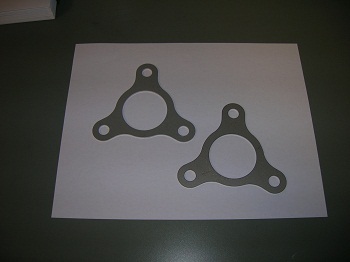 TWM 45 mm throttle bodies with DCOE bolt pattern. Compatible with Electromotive Tec engine management systems. Let us know if you want big power at the top end along with a good idle and strong mid-range torque.